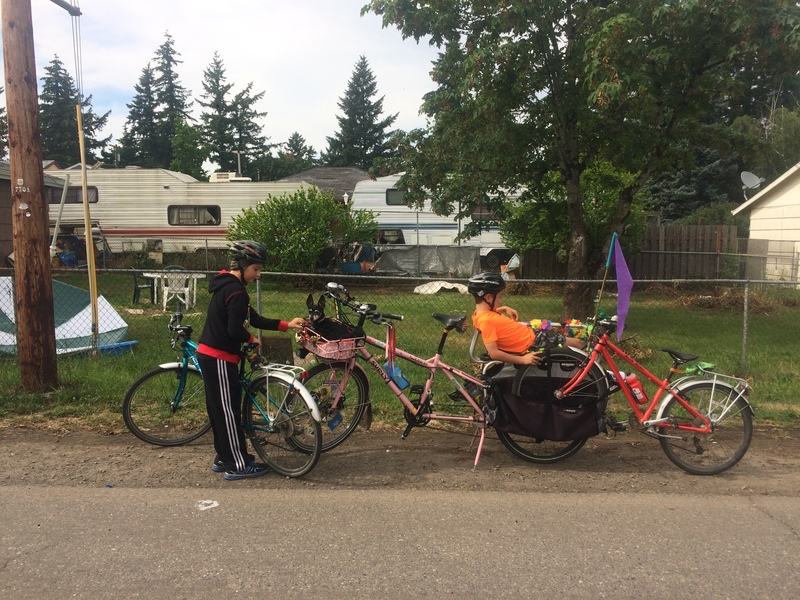 Yesterday was a fairly typical bikey day for summer break (or a weekend any time of year). I have a small list of things to do/places to visit over summer which includes the Crystal Springs Rhododendron Garden. We live very close to it and haven’t been yet, and it’s free on Mondays! (And only $5 for adults on non-Mondays.) And dogs are allowed! 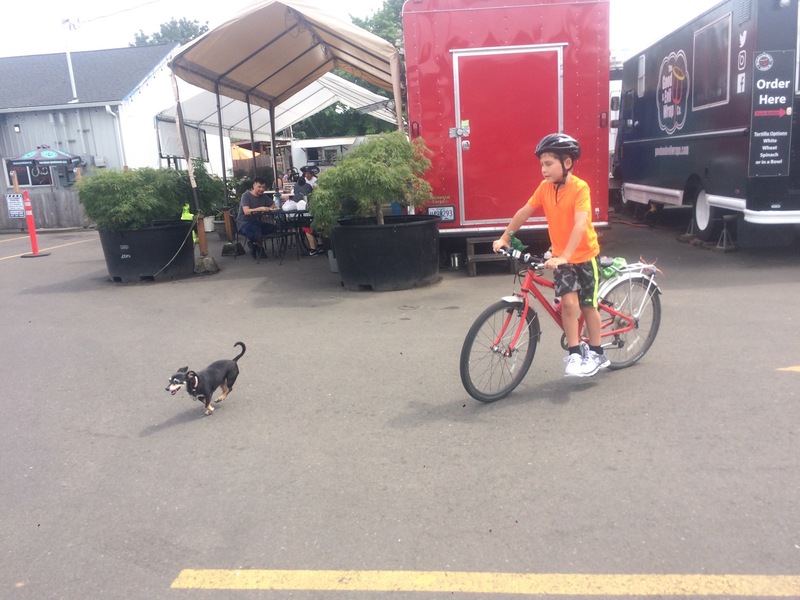 If I were biking there without the kids I’d just take the most direct route — the bike lane on a busy street, but we zig zagged through the neighborhood and then cut through Reed College. 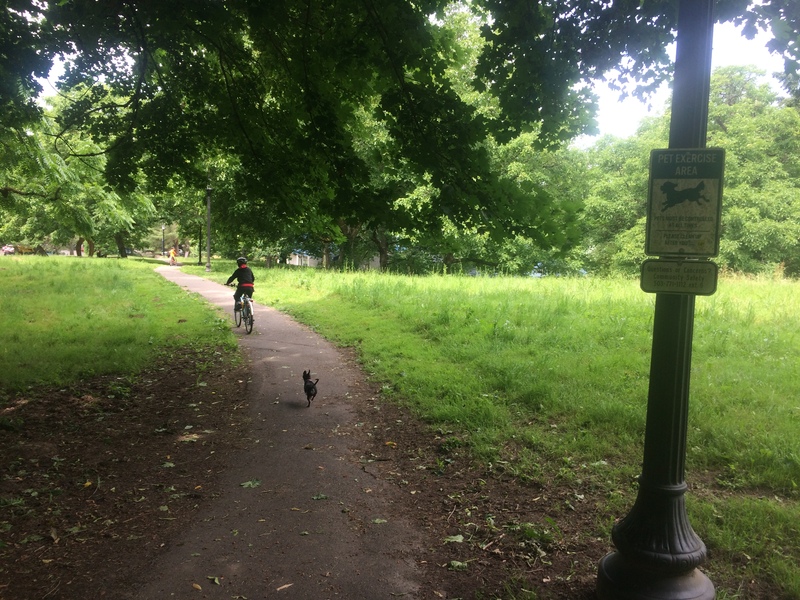 It made for a very nice ride, and I let Pixie out of the basket to run through Reed, starting at the “Dog Exercise Area” field where we enter the college. The gardens were lovely, though past bloom time. 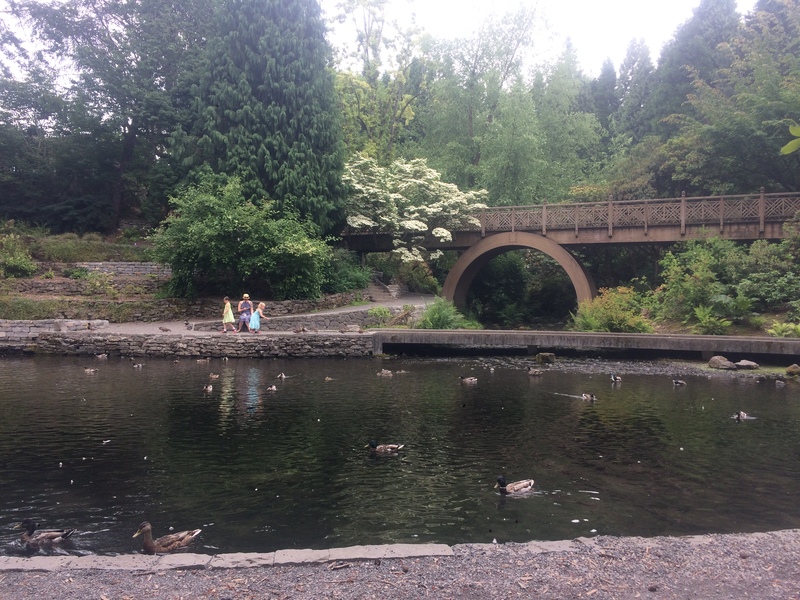 It turns out people visit the gardens year round to see the ducks…which I realized when we ran into one of my younger son’s classmates hanging out on the nice lawn at Reed College whose mom said at least there are still some adolescent ducks in the pond. Fortunately she was wrong and there are lots of babies, too! 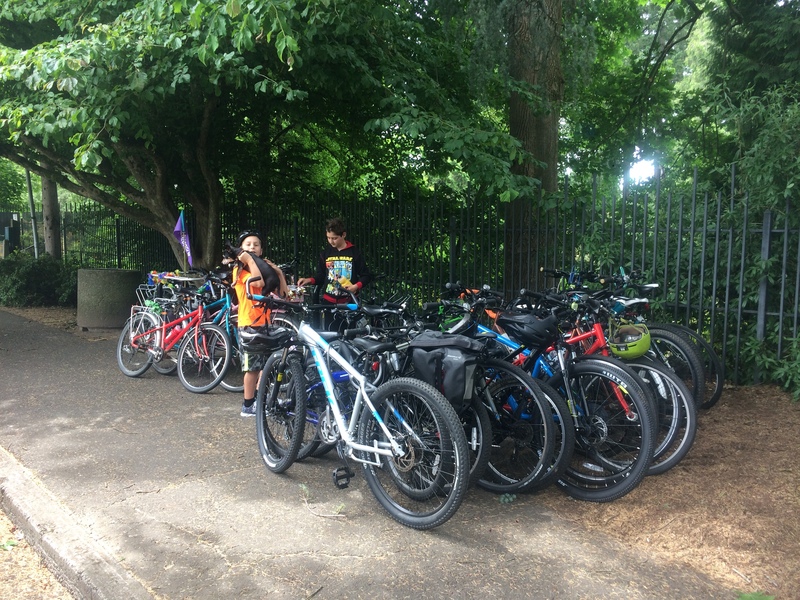 We saw a ton of bikes at the racks when we arrived (a summer camp?) but didn’t see a ton of people inside the park. 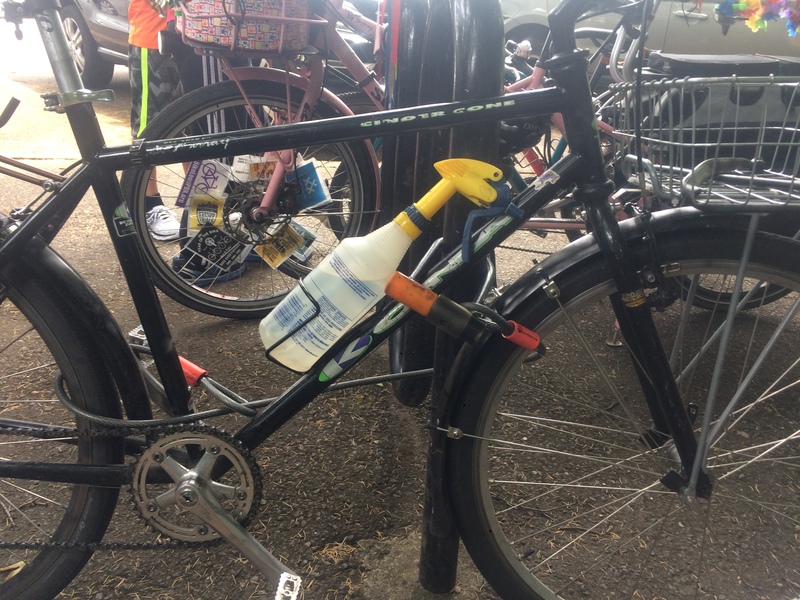 We also saw this smart idea: squirt bottle in drink cage. It was pretty hot today so I had water on the mind all day. The kids each had one water bottle and I brought two. But I should have filled all four of my drink cages so we’d have more backup. 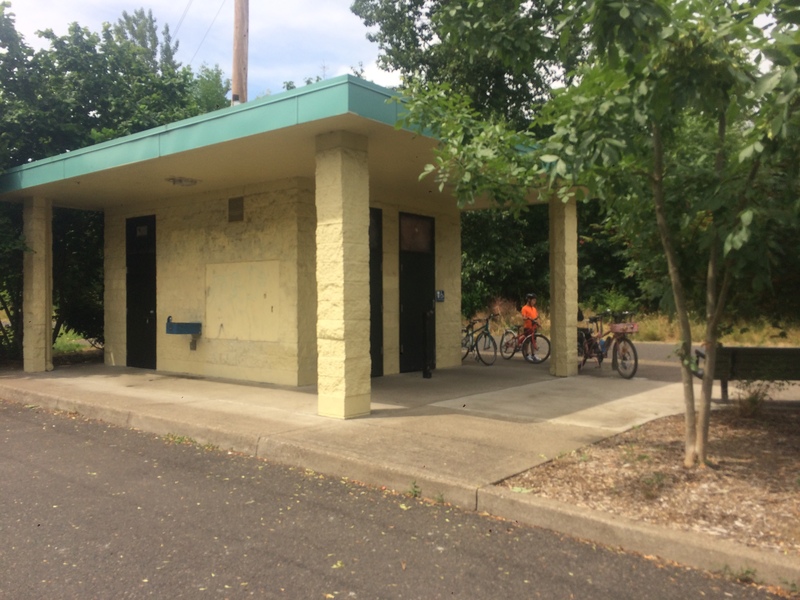 I don’t think there’s a drinking fountain at the rhododendron garden, and I think the only restroom are the three porta-potties out by the bike rack and parking lot. Just visiting the garden didn’t seem like enough of a day so I combined it with lunch. 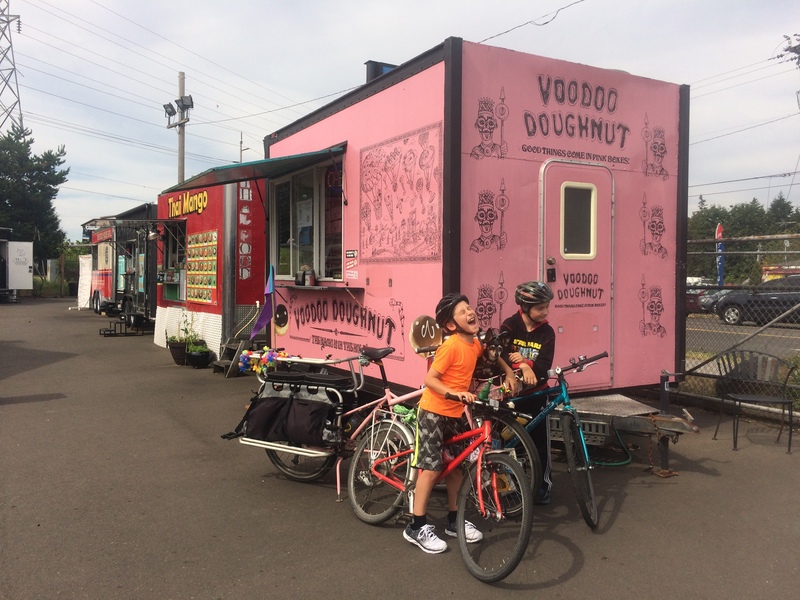 Rather than climb back up through Reed College to get to a lunch place near home, it seemed to make sense to get over to the Springwater Corridor Trail and take that to the Cartlandia food truck pods. I didn’t bother pouring over route options at home like usual, but the default Google maps one wasn’t bad. 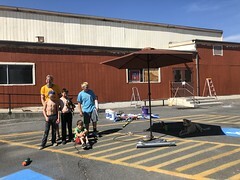 We stuck to sidewalks for the fast streets and had to climb some small hills, but we discovered a new-to-us [small] playground on the way! 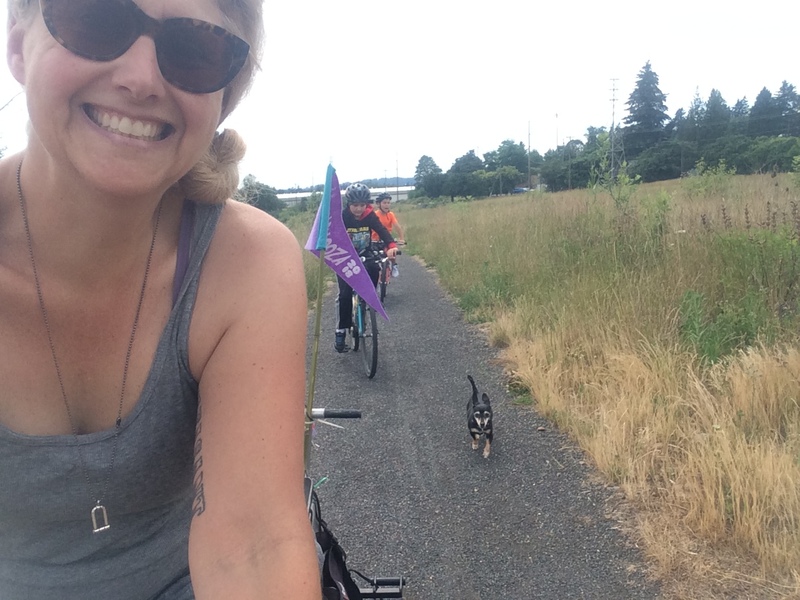 The Springwater Corridor Trail is terrific. The north/south section is closing for a while soon, but we usually use the east/west section. And we popped out on the trail conveniently close to the restrooms and drinking fountain so I filled all our water bottles since Cartlandia has no water other than small plastic water bottles for purchase. Once we got to the part with the gravel side path I let Pixie out again to run alongside. We left her out to cross one road and roll into Cartlandia with us. Good girl! 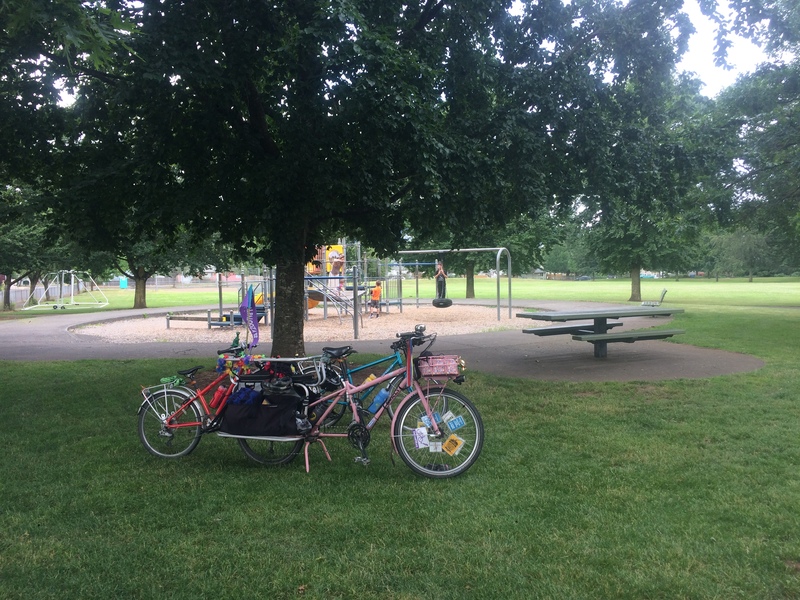 Cartlandia is downhill from our house, but there are two ways to get home with very gentle grades. 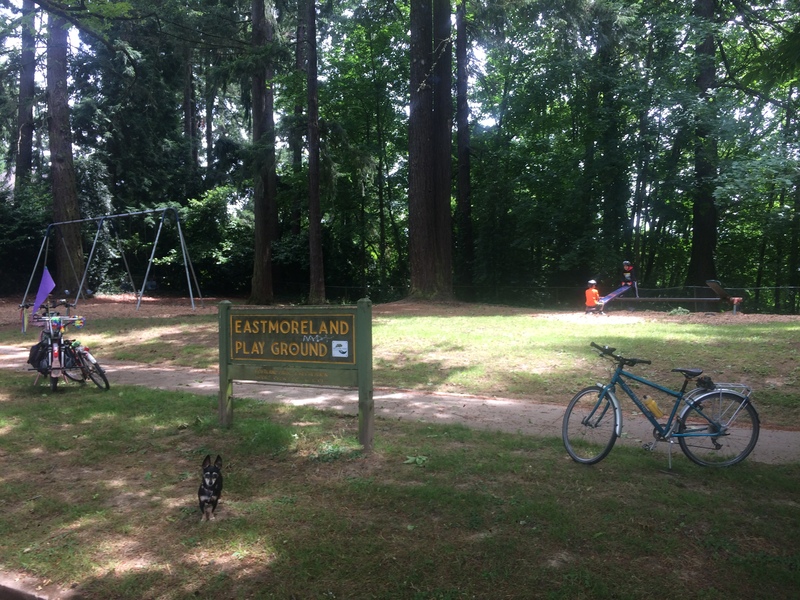 We chose the one that takes us by a playground to stop and play more. Barely on the way there my eight-year old developed a tummy ache and needed to be carried, but he was all better by the time we arrived at the park so Pixie and I hid in the shade while the kids played on the play structure and rode their bikes all over the park. 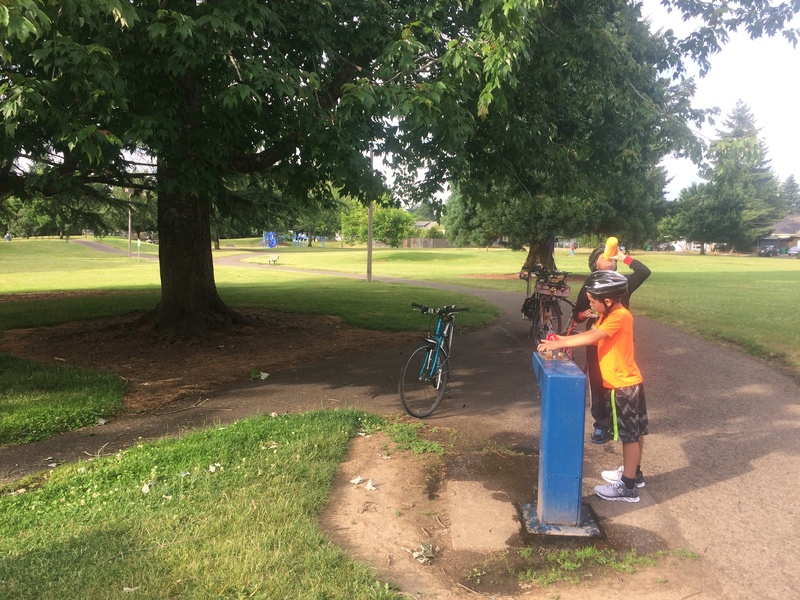 Unfortunately this park has no water (I think it’s broken and hopefully will be replaced at some point) so we ran out during our lengthy play break and stopped at another park to fill water bottles on the way home. All in all it was a great way to kill six hours in only nine miles. Here’s our day in map form. It proved to be a pretty tiring day and we were all dragging today, especially Pixie and the eight-year old. I think our stamina will increase as summer break drags on, but in the meantime I might aim for shorter outings on the hot days.